NC State CVM researchers found that stereotactic radiation therapy, or SRT, is a feasible, less time-intensive option for treating intracranial meningiomas and results in survival rates similar to other approaches. At the NC State Veterinary Hospital, personalized care means more than just offering a wide range of treatment options — it means constantly developing the best therapeutic approaches for each and every animal we see. 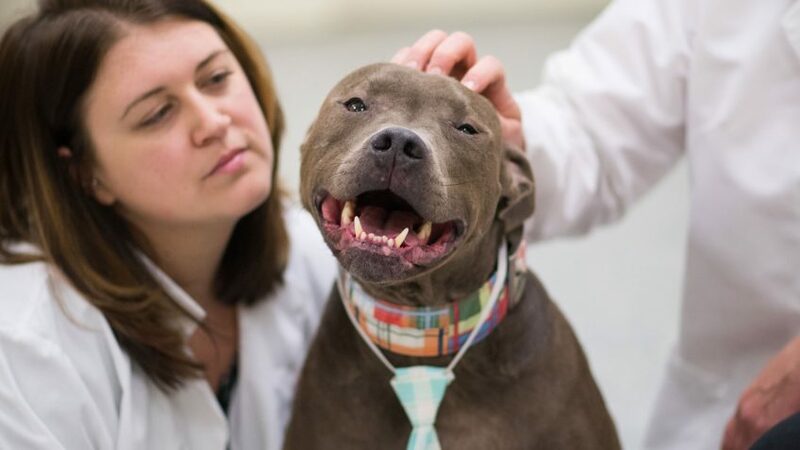 The hospital’s radiation oncology service traditionally — and effectively — treats meningiomas, a common type of brain tumor in dogs, with surgery and radiation therapy. 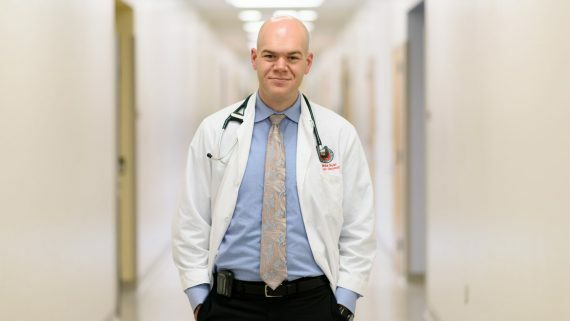 While surgery quickly removes the tumor, a schedule of up to 20 daily treatments makes radiation therapy inaccessible for some dogs and their families, said Mike Nolan, assistant professor of radiation oncology and biology. So Nolan and fellow CVM researchers Krista Kelsey and Tracy Gieger tested a different way. The team found that stereotactic radiation therapy, or SRT, is a feasible, less time-intensive option for treating intracranial meningiomas and results in survival rates similar to other approaches. The pilot study was recently published in the journal Veterinary Radiology & Ultrasound. We spoke with Nolan about the promising research and the potential for future advances in treating canine brain cancer. What does this study suggest about the therapeutic value of stereotactic radiation therapy? We were able to conclude that stereotactic radiation therapy, given in a single treatment session, is a reasonable alternative to full-course radiation therapy for many dogs. Our results suggest that there may be a somewhat higher risk of serious side effects with SRT, but for most dogs treatment is well tolerated. For many families, the increased risk is balanced by a significant improvement in convenience and a significant reduction in anesthesia. The good news is that for dogs who tolerate SRT well, the long-term prognosis is just the same as what we expect with full-course RT. The bottom line is that SRT can be a highly efficient treatment for meningiomas. If we take a big picture view, it’s sort of like using a spotlight to find your way around a dark room rather than using a floodlight. With the spotlight, you can shine a super bright light on the door, but the rest of the room remains pitch black. SRT does the same thing. It dumps huge amounts of radiation into cancerous tumors while physically shielding the surrounding normal tissues from potentially damaging doses. SRT utilizes specialized training and technology to ensure rapid, accurate and precise delivery of large doses of radiation to a well-defined target. Mike Nolan, assistant professor of radiation oncology and biology. Why should SRT be considered in treatment plans for canine brain tumors? When is it considered more desirable than a different type of treatment? SRT is great. It’s convenient and often associated with outcomes that rival or exceed that which is expected from more conventional irradiation techniques, but there are circumstances when SRT can be more dangerous or can yield inferior prognoses. That’s why when deciding if SRT is the right choice for your pet, it’s incredibly important to have an in-depth discussion with an experienced radiation oncologist who can help navigate all of the options. How far have we come in the past decade or so in treatment of canine brain tumors? We’ve come pretty far. Not only can we now safely and non-invasively treat a range of canine brain tumors with SRT, but there have also been improvements to the more conventional radiation therapy techniques. Beyond radiation, there is also a range of novel surgical techniques that benefit certain patients. There’s promising new immunotherapies, too. Together, these emerging therapies hold a lot of promise and should help us make even more impressive gains in the decade to come. Do the results of the study make you feel optimistic about canine brain tumor treatment advancements? I don’t expect miracles, but my hope is simply that we can inch closer to a cure. This study was our first step, but there is still plenty to learn. I think the biggest success is the fact that we’ve been able to use the results of this study to modify our SRT approach for management of canine intracranial meningioma. From each dog, we learn something that can hopefully benefit the next dog who is diagnosed with a similar problem. As long as we stick with that approach, I remain incredibly optimistic. For more information on the NC State Veterinary Hospital’s radiation oncology service — and stereotactic radiation therapy — go here.